The Q-Series Hydraulic Post Drivers features two QuickChange™ systems to keep the operator building fence. The new patent pending Q-Spring assembly reduces change-over time and increases spring life and the SplitCap™ design allows easy servicing of the rod seal. Ranchmate ®is an innovative line of wire fencing products and accessories. It enables farmers and ranchers to construct and mend wire fences smilar to the way utility linemen have built and fixed overhead conductor lines for decades. Superior strength, durability and ease of installation make Ranchmate the new standard in wire fencing. The most important part of fence construction is the proper installation of corner and brace assemblies. To assure your Red Brand fence lasts a long time, check out Red Brand's free Installation Videos. For more information or to find a dealer near you, visit redbrand.com. To complement it’ technically advanced electric fence chargers, Parmak has added over 32 new electric fence items, including a full line of insulators for Rod Posts, Steel T-Posts and Wood Post, a wide selection of step-in posts and expanded High Tensile fence accessories including Fence Wire Strainers, Heavy Duty Tension Spring and complete selection of High Tensile Crimping Sleeves, Taps and Crimping Tool. For more information, visit www.parmakusa.com or call 1-800-662-1038. 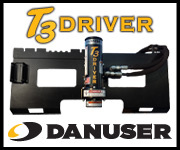 Designed for T-posts, the T3 can drive up to 3” O.D. pipe. Versatile mounting options available for quick attach systems as well as a bolt-on/weld-on bracket that mounts to a flat surface. Limit fuel consumption by operating at a lower RPM, maximum efficiency is achieved at 15 GPM. Provides a strong physical and psychological barrier at a lower cost. Available in four (30" tall) or five strands (40" tall) in 660' rolls of 12.5 gauge hi-tensile wire that can be electrified. Provides a strong perimeter fence in case of power loss. Special lock knot provides a secured vertical stay for added strength. For more information, visit www.twinmountainfence.com or call (800) 527-0990.